^ "Official Charts Analysis: Linkin Park pip Maroon 5 to No.1 by 3k sales". Retrieved 2012-07-17. ^ "Media Centre - The Voice UK: will.i.am". BBC. 2013-06-01. Retrieved January 13, 2014. ^ McLean, Craig (May 30, 2009). "Force of Will". New Zealand Herald. Retrieved 2013-02-25. Aged 25, when a passport application resulted in him seeing his full birth certificate for the first time, he found out that his real, full name was William James Adams Jr. He was named after his Jamaican father he never known, and whom no one in his family ever discussed. ^ Dawson, Kim (February 15, 2011). "Brit awards 2011: plan b". The Daily Star. Retrieved 2012-10-07. The Black Eyed Peas frontman ... has William James Adams on his passport. ^ Dennis, Steve; Taboo (2011). Fallin' Up: My Story. New York City: Simon & Schuster. p. 56. Retrieved 2012-02-18. ^ Will.i.am on Living in East Los Angeles - Exclusive Interview on NELA TV (Interview). Los Angeles, CA: egentertainment.net. 2011-02-17. ^ Paul Scott (2012-06-06). "Just who is will.i.am? From Olympic torch to Diamond Jubilee, how US star gatecrashed the celebrations". Mail Online. Retrieved 2013-04-14. ^ "The L.A. Times music blog | Will.i.am on Rave Culture: "The underground is bigger than the surface. That's what people don't understand."". latimesblogs.latimes.com. Retrieved 2016-02-07. ^ "Big Builder - Home Building Industry News and Archive Information". Builder Online. 2012-02-03. Retrieved 2012-03-02. ^ "Songs for Survival – Survival International". Survivalinternational.org. Retrieved 2010-11-12. ^ Swift, Jacqui (2008-10-17). "Bruce Parry says he owes the tribal people so much. Showbiz, Something For The Weekend". The Sun. London. Retrieved January 25, 2010. ^ "". "Will.I.AM talks to 2NE1". YouTube. Retrieved 2010-11-12. ^ Navjosh (May 24, 2011). "Will.i.am To Release New Solo Album 'Black Einstein'. On October 24, 2011, songs were leaked through the internet after a presentation in club hosted by HTC. One of these songs is called "T.H.E (The Hardest Ever)" with vocals by Jennifer Lopez and Mick Jagger". Hip Hop N More. Retrieved 2011-09-21. ^ Wood, Beci (February 5, 2010). "Will.i.am is Zuper Blahq". The Sun. Retrieved 2011-09-21. ^ "Will.I.Am tweet about his new song "The Hardest Ever (T.H.E.)"". Twitter. 2011-10-12. ^ Mark Savage (2012-02-22). "Cheryl Cole and Justin Bieber join will.i.am album". BBC News. ^ a b mars.nasa.gov. "Curiosity Rover Plays First Song Transmitted From Another Planet". mars.jpl.nasa.gov. Retrieved 2016-02-07. ^ Nyay Bhushan (August 25, 2012). "Priyanka Chopra's First Single to Debut on NFL's 'Thursday Night Kickoff'". Hollywood Reporter. Retrieved 2012-09-13. ^ Goodacre, Kate. "will.i.am and Chris Brown's 'Let's Go' in copyright breach allegation". Digital Spy. Retrieved 2013-04-17. ^ "Will.i.am Rips Off Arty & Mat Zo's 'Rebound' for Latest Single". TranceFixxed. 2013-04-17. Retrieved 2014-02-09. ^ "will.i.am : "Feeling Myself" feat. Miley Cyrus, Wiz Khalifa et French Montana en יcoute". Chartsinfrance.net. 2013-04-21. Retrieved January 13, 2014. ^ "will.i.am on Chatty Man: New music and the watch". iam-fan.com. Archived from the original on 2014-10-05. ^ "Steve Aoki 'I'll Sleep When I'm Dead' Documentary Hits Netflix | The Nocturnal Times". www.thenocturnaltimes.com. Retrieved 2017-07-27. ^ "Will.i.am asked for Cheryl's advice over 'The Voice' role". MTV. January 2, 2012. Retrieved 2012-02-02. ^ "2013 FRC Championship Awards List". Retrieved 2013-06-02. ^ Olivarez-Giles, Nathan (January 25, 2011). "Will.i.am named Intel's director of creative innovation". Los Angeles Times. Retrieved 2012-05-06. ^ "NASA Joins Musician will.i.am, Discovery Education for Premiere of Song from Mars". Space Industry News. 1975-03-15. Archived from the original on 2013-03-01. Retrieved 2013-04-14. ^ .i.am, will [@iamwill] (15 November 2017). "When I was little willie in the ghetto & taking a 2hr bus ride to Brentwood Science Mangnet school, I never would have thought this was possible...but look what a early #stem education does...thank you mama, thank you @TheIET & thank you #BrentwoodScienceMagnetSchool" (Tweet). Retweeted by @theIET [Wikimedia] – via Twitter. ^ Kaufman, Gil (2010-12-07). "Will.I.Am Reveals He Has Tinnitus, Ringing In The Ears". MTV. Retrieved 2011-02-22. 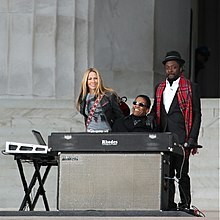 ^ "Black Eyed Peas | Will.i.am Has Adhd | Contactmusic.com". contactmusic.com. Retrieved 2016-02-07. ^ "Perez Hilton Asks Twitter Followers to Call Police on will.i.am". Los Angeles Times. 2009-06-22. Retrieved 2015-06-16. ^ "Nominations - Mirchi Music Award Hindi 2012". www.radiomirchi.com. Retrieved 2018-04-27. This page was last edited on 18 April 2019, at 08:15 (UTC).